This is a Large Zipper Tote that I made for Mel in Murray Corner, New Brunswick, Canada. 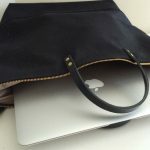 Mel actually ordered a Medium Zipper Tote earlier this summer, but she wanted a larger one to fit her 15″ laptop. The medium size fits a 13″ laptop. It turned out that her friend liked the medium size and bought it from her, so she was able to order another one. Mel wanted her new large tote to look exactly like the one she had before. 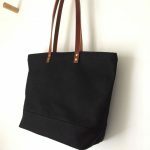 In stock, the black tote has black leather shoulder straps. Mel liked the brown leather straps on it. It’s amazing how a slight change can make a bag look so different. 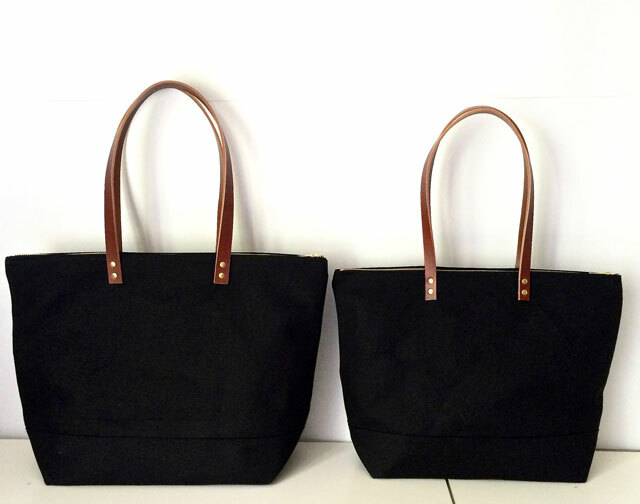 This is the size comparison of the Large Zipper Tote versus the Medium Zipper Tote. What’s mainly different about these 2 bags is, of course, the size (please see specs at the end of this post). 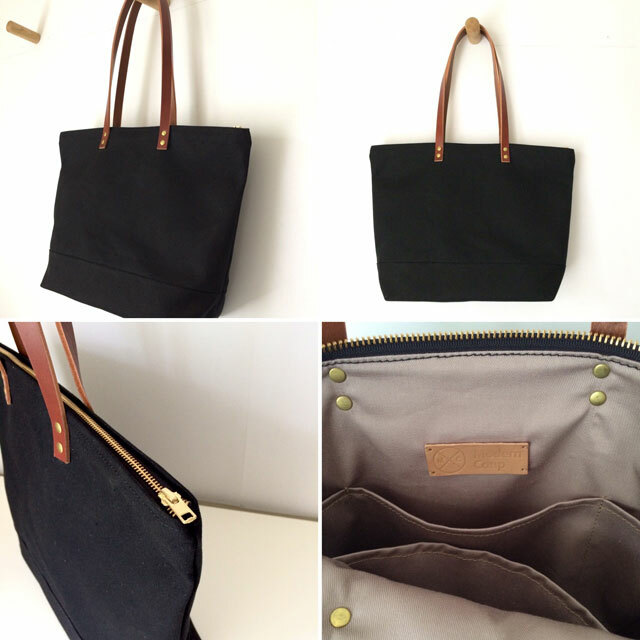 Also, the large size has 5 interior pockets for organization, rather than 4 in the medium size. Inside Pockets: 5 pockets: 2 water bottle pockets, 1 large pocket and 2 medium sized ones. This large size Zipper Tote is only available through custom order. Please contact me at cathy[at]moderncoup.com or through my Etsy Shop if you’re interested in a similar bag handmade for you. 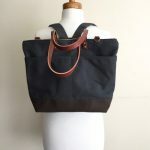 The Medium Size Zipper Totes in the shop are ready to ship in 2-3 business days, if you’re looking for an in stock bag.